Did you know that July 28 is National Milk Chocolate Day? Chocolate bars were first invented in 1847 (but these were not milk chocolate bars). In 1879 Rodolphe Lindt (yes, as in Lindt chocolate!) invented a conching machine which made smooth, creamy chocolate like we have today. The same year, 1879, Daniel Peter made the first milk chocolate bar. Milk chocolate tastes more like sugar and milk than cacao, and so it was originally marketed for children. Most milk chocolate bars today have less than 33% cacao. I will admit that I prefer the sweeter milk chocolate to dark chocolate, which has a stronger taste. 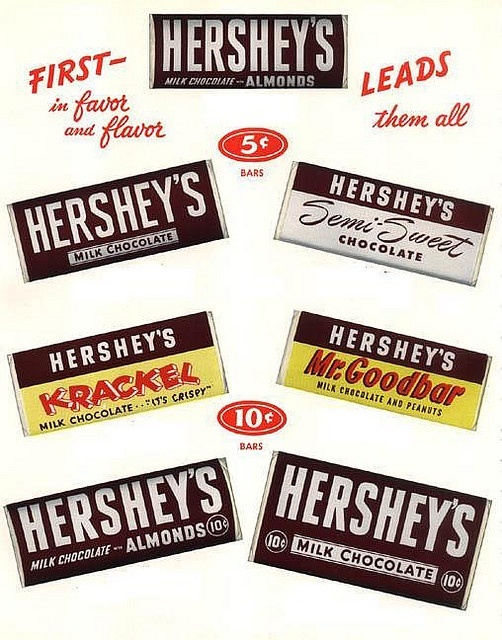 My favorite candy bar - and also my favorite milk chocolate - is the Hershey bar. This candy bar was invented in 1900. 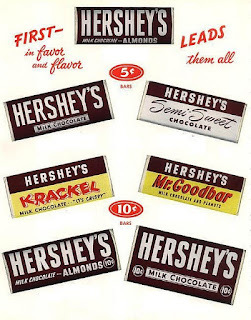 The vintage ad above shows all the 1950's varieties of Hershey bars. How about you - do you like milk chocolate? And what is your favorite milk chocolate bar? I'd love to hear from you in the comments below. Hershey's milk chocolate bars are STRAIGHT out of my childhood! My dad always use to buy me one on our way up north to our cabin. I used to eat them piece by piece. Now that I think about it, I haven't had one in a LONGGG time! Love this!! National chocolate day on a chocoholics birthday makes it even better...YAY!! Well, this just gives me an excuse to have some chocolate! Yum. If I could eat one food for the rest of my life it would be chocolate. Milk or dark, it's all good. Thanks all for the visits!